Wedding tents are used for outdoor parties, marriages, fairs etc. These tents are installed at various ceremonies and functions and are manufactured using strong material to ensure prolonged service life. They are durable, thick and can be easily set for different functions and ceremonies. Extensively used in marriages and weddings tents are easy to assemble as well as dismantle and can make wedding look glamorous and enchanting. Our tents are available in various sizes, attractive designs and colour combinations. Aesthetic Wedding Tent Offered by us has a sophisticated style that complements beautifully with lavish surroundings of the wedding day. 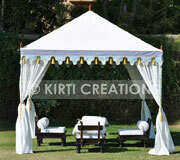 Off white color along with specially designed borders makes these tents perfect for hosting traditional events.